I have always been a health nut, but since I went natural many years ago, I realized that I didn't have to just check the labels on my food. I now check labels on every thing including nail polish. 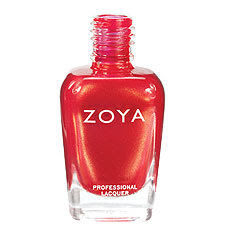 I know there is no perfect nail polish, but ZOYA's polish was the first to remove toxic ingredients such as toluene, camphor, formaldehyde and DBP (dibutyl phthalate) from its formulations. Since they have such trendy colors it wasn't hard to switch over from what I was originally using. I decided to try an orange color polish to match an outfit I wore this weekend. 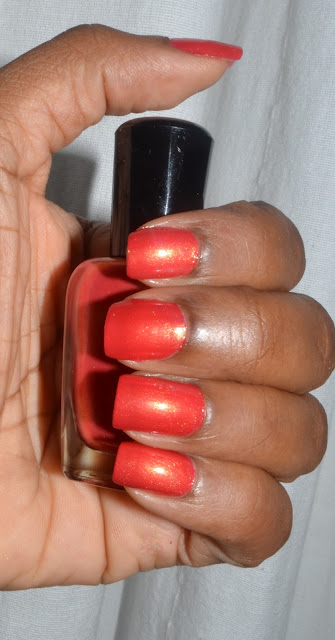 Zoya Nail Polish in Lana can best be described as a rich red metallic duochrome. A frosty hint of orange creates a unique "oil-slick" look. I don't have steady hands so I went to the nail shop to get it done. So have you ever tried zoya's nail polishes? If so which one?